NOTE:Please compare the detail sizes with yours before you buy!!! Use similar clothing to compare with the size.wish you enjoy the shopping. 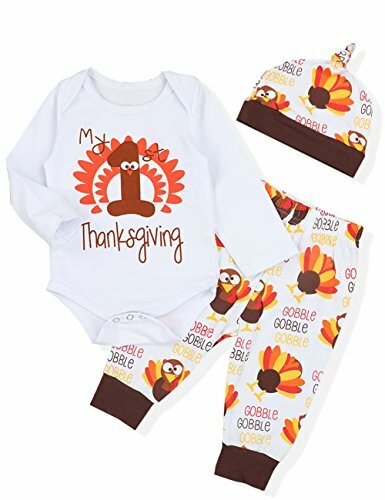 Newborn baby girl clothes, Super lovely and funny print "My First Thanksgiving" with Cute little turkey pattern Pants+Hat , this will sure to attract many laugh. It's a perfect Thanksgiving's Day, birthday and gift, also play outside, photography, family day or any occasions. Cute baby girl romper, Stretchy fabric and elasticity Hat, make your little one feel comfortable. For infant cute baby boy girl 0-18 months / for spring / fall / winter;unique and attractive. Package include:1PC Tops+1PC Pants+1PC Hat. If you have any questions about this product by Doding, contact us by completing and submitting the form below. If you are looking for a specif part number, please include it with your message.